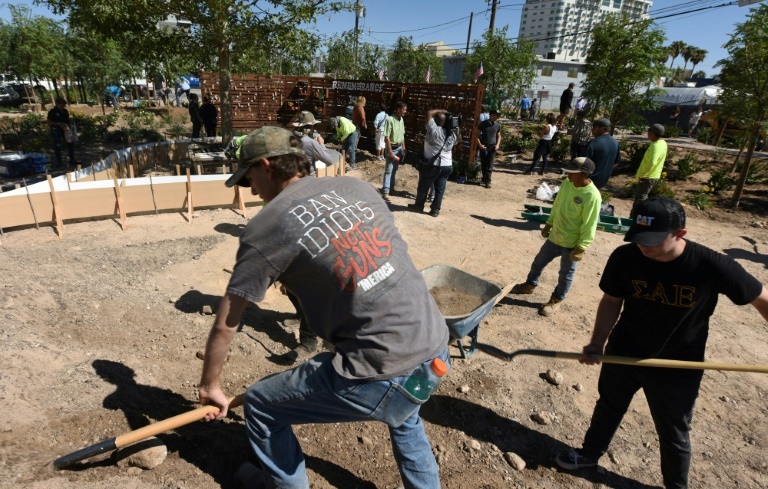 Far from the Las Vegas Strip and its flashy hotels, a small healing park opened Friday in the north of Las Vegas, as communities shaken by Sunday’s horrific mass shooting join together to grieve. 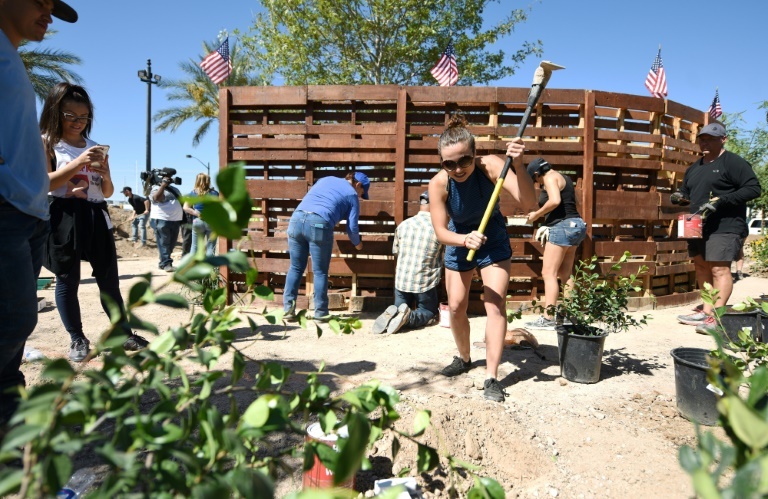 One of its creators, landscape architect Mark Hamalmann, said it is a “remembrance garden,” featuring 58 trees planted along a small paved walkway. In the middle, there is a large oak tree representing the “tree of life,” while American flags adorn a wooden fence. 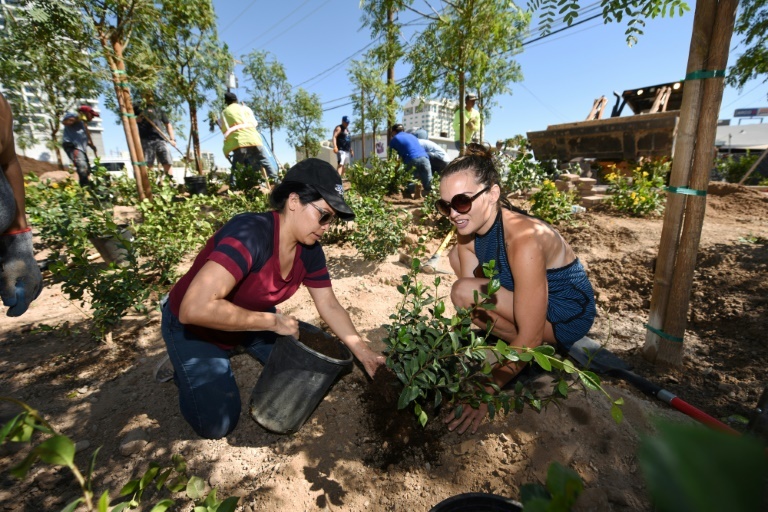 “Everything here is donated by local companies, everyone here is a volunteer, and it’s just amazing how it’s come together,” Hamalmann, who oversaw the garden’s construction, told AFP. In the healing park, he explained, everyone is welcome to walk, sit and reflect on the benches, or leave messages on a wall of remembrance. And there is little doubt healing is what Las Vegas needs. Fifty-eight people died and nearly 500 were injured when 64-year-old Stephen Paddock opened fire on an outdoor country music festival — an act that investigators are still at a loss to explain — before taking his own life. Since the shooting, “I can’t sleep. I think probably the adrenaline is still running and I can’t wrap my brain around what I saw,” said Dori McKendry, a driver for rideshare startup Lyft. McKendry was parked in front of the Mandalay Bay hotel Sunday night when Paddock started shooting from his 32nd-floor room. Admitting she currently has a “mental and emotional feeling of insanity,” McKendry said she has offered free rides to victims’ families to help process what happened. Paddock, a retired accountant and high stakes gambler, lived quietly in the small town of Mesquite, Nevada, north of Las Vegas. His neighbors, his family and even his girlfriend said they had no clue about what he was about to do. Several clinics in Las Vegas have organized counseling sessions for people struggling since the shooting — including survivors, relatives or simply those suffering from anxiety in the wake of the atrocity. At the University of Las Vegas (UNLV), a clinic was set up at The Practice, where psychology students are trained. Some who seek help “want to talk and share,” while others “will feel pretty constricted and not be ready,” director Michelle Paul said, adding it’s important to “provide a sense of security, safety, comfort, basic problem solving,” to disoriented patients. “What we try to do is work collaboratively with clients and try to figure out for them, what’s going on for them, normalize that, and then also help them come up with some positive coping strategies,” she explained. For psychologist Daniel Filacora, of private clinic Bridge Counseling, talking about the details of traumatic experiences helps disconnect negative emotions from the event. “Telling one’s story, especially in such a dramatic event, is important to differentiate between what really happened and the negative emotions attached,” he said. It is even more important in Las Vegas, a world-famous party hotspot where an attack on a large gathering of 20,000 people is “particularly traumatic,” he added. “At a community level, we’re obviously more traumatized because it is in our community now,” added Michelle Paul.